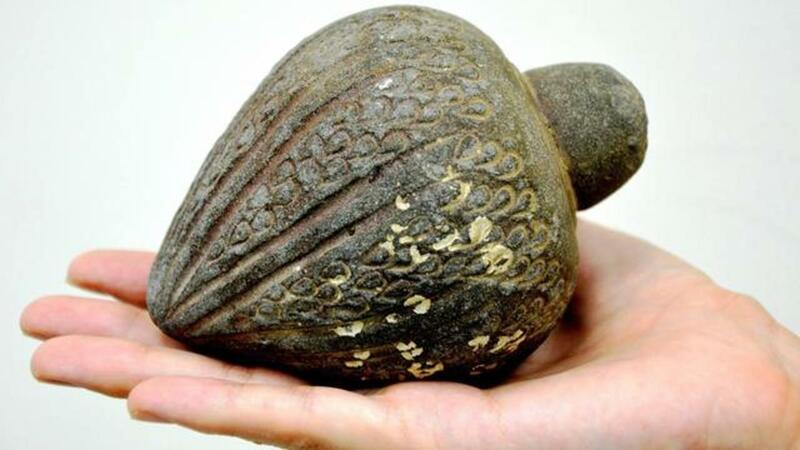 The Israel Antiquities Authority has recently announced the recovery of several rare objects including a grenade estimated to be 700-years old, reported the Times of Israel. According to a press release, a family reached out to the organization after the death of their father who had worked at a power station and collected artifacts from the sea. Among these items was the ornate hand grenade which is made of heavy clay and has been likened to a Molotov cocktail. Diego Barkan, an archaeologist with the Israel Antiquities Authority told the Daily Mail that the grenade's use could be traced through the Byzantine, early Islamic, and Ottoman periods. Other pieces that were turned over include a knife head from more than 3,500 years ago as well as mortars and pestles from the 11th century. These artifacts are believed to have ended up in the water after falling from a merchant's ship. Interior shot of the cup, with the bottom removed. The gold ring found inside. An analysis of the jewelry suggests it was made in Poland between 1921 and 1931. An x-ray image of the mug.